1. 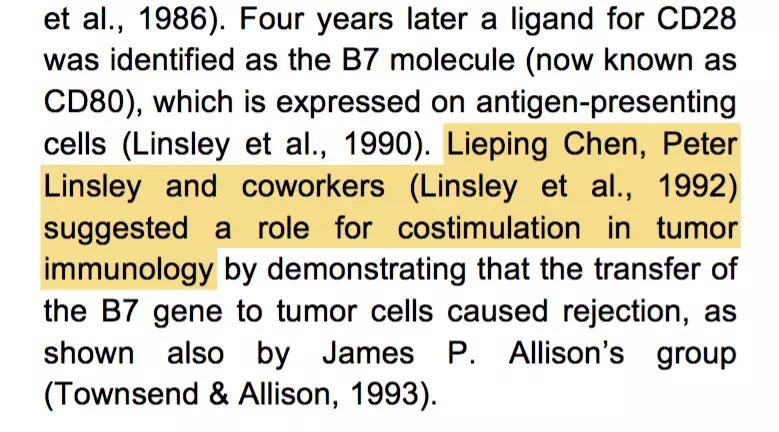 Chen L. Co-inhibitory molecules of the B7-CD28 family in the control of T-cell immunity. Nat Rev Immunol. 2004， 4（5）：336-47. 2. Korman AJ， Peggs KS， Allison JP. 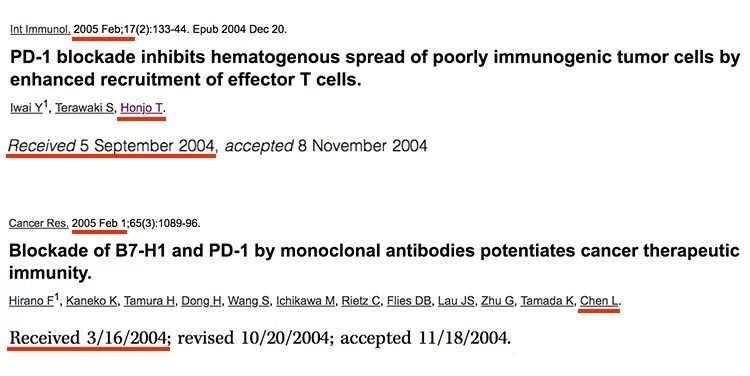 Checkpoint blockade in cancer immunotherapy. AdvImmunol. 2006， 90：297-339. 3. Freeman GJ， Long AJ， Iwai Y， Bourque K， Chernova T， Nishimura H， Fitz LJ， Malenkovich N， Okazaki T， Byrne MC et al. 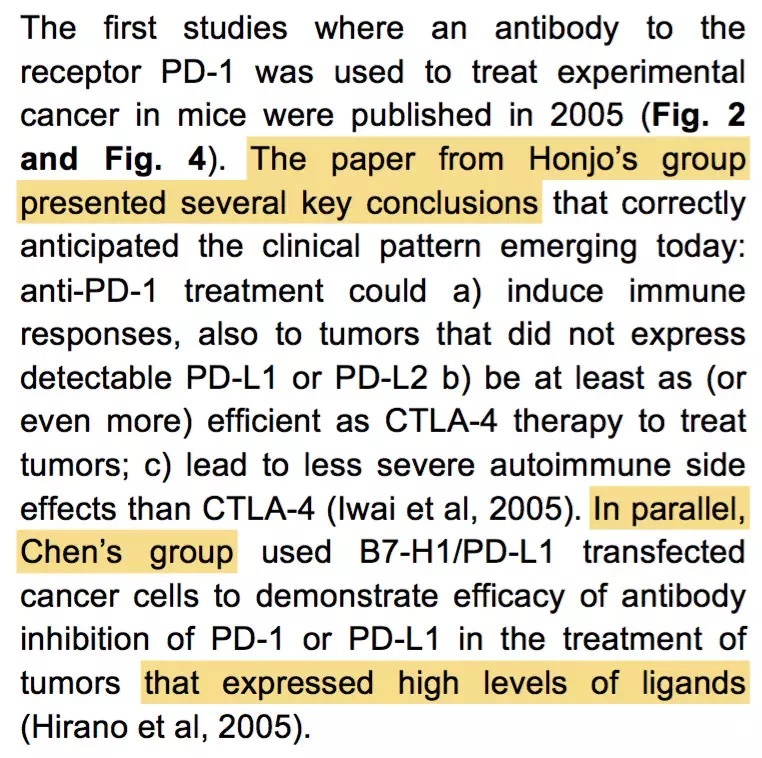 Engagement of the PD-1 immunoinhibitory receptor by a novel B7 family member leads to negative regulation of lymphocyte activation. J Exp Med. 2000，192（7）：1027-34. 4. 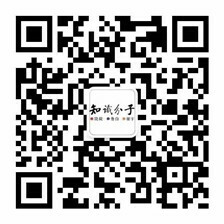 Dong H， Chen L. B7-H1 pathway and its role in the evasion of tumor immunity. J MolMed （Berl）. 2003， 81（5）：281-7. 5. 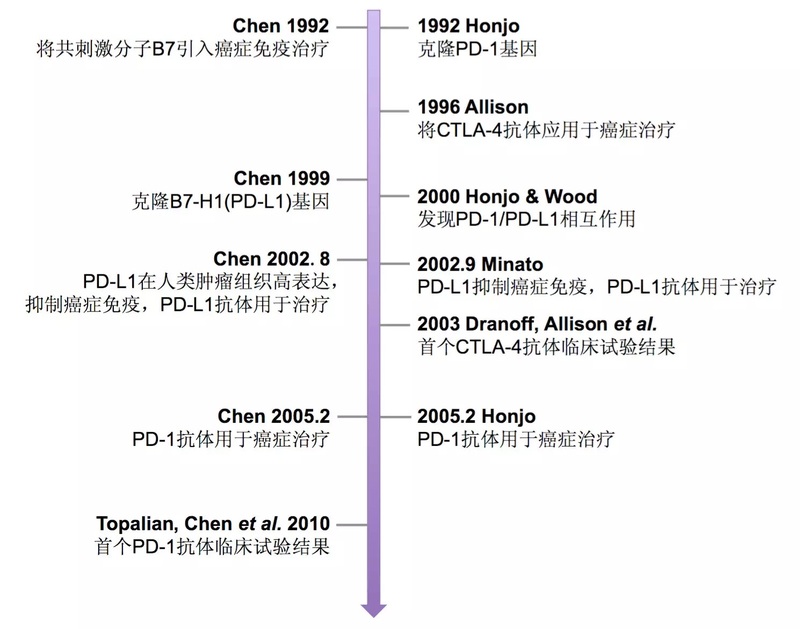 Chen L， Han X. Anti-PD-1/PD-L1 therapy of human cancer： past， present， and future. J Clin Invest. 2015， 125（9）：3384-91. 6. Wolchok JD， Chiarion-Sileni V， Gonzalez R， Rutkowski P， Grob JJ， Cowey CL， Lao CD， Wagstaff J， Schadendorf D， Ferrucci PF et al. Overall Survival with Combined Nivolumab and Ipilimumab in Advanced Melanoma. N Engl J Med. 2017， 377（14）：1345-56. 7. Dong H， Strome SE， Salomao DR， Tamura H， Hirano F， Flies DB， Roche PC， Lu J， Zhu G，Tamada K et al. 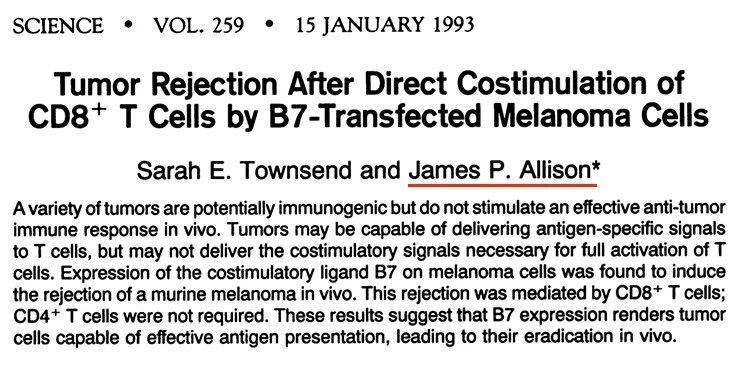 Tumor-associated B7-H1 promotes T-cell apoptosis： a potential mechanism of immune evasion. Nat Med. 2002， 8（8）：793-800. 8. Lowe D. A Nobel for Immuno-Oncology. Sci Transl Med. 2018. 9. Brahmer JR， Drake CG， Wollner I， Powderly JD， Picus J， Sharfman WH， Stankevich E， Pons A， Salay TM， McMiller TL et al. PhaseI study of single-agent anti-programmed death-1 （MDX-1106） in refractory solid tumors： safety， clinical activity， pharmacodynamics， and immunologic correlates. J Clin Oncol. 2010， 28（19）：3167-75. 10. Topalian SL， Hodi FS， Brahmer JR， Gettinger SN， Smith DC， McDermott DF， Powderly JD，Carvajal RD， Sosman JA， Atkins MB et al. 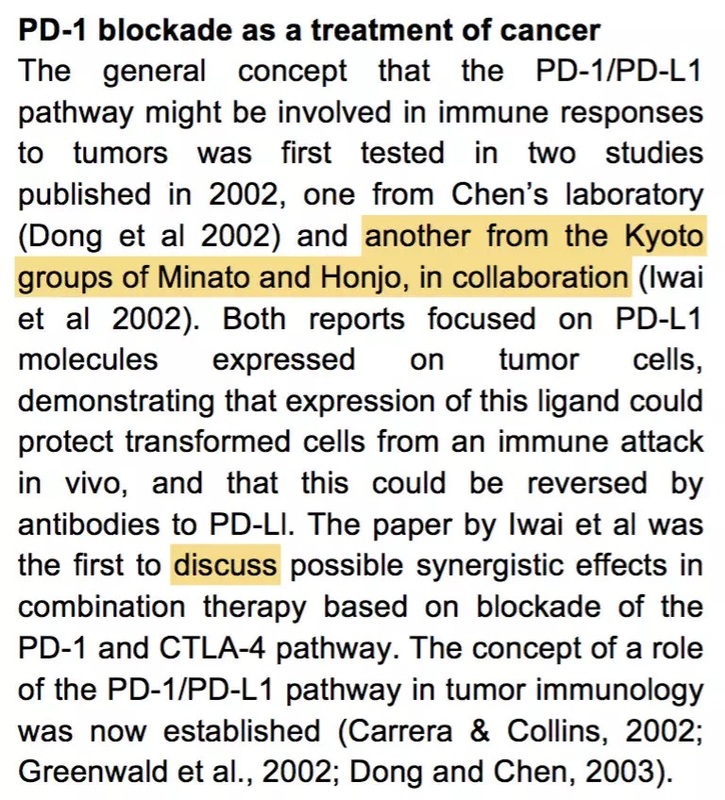 Safety， activity， and immune correlates of anti-PD-1 antibody in cancer. N Engl J Med. 2012， 366（26）：2443-54. 11. Taube JM， Anders RA， Young GD， Xu H， Sharma R， McMiller TL， Chen S， Klein AP， Pardoll DM， Topalian SL et al. Colocalization of inflammatory response with B7-h1 expression in human melanocytic lesions supports an adaptive resistance mechanism of immune escape. Sci Transl Med. 2012， 4（127）：127ra37. 12. Latchman Y， Wood CR， Chernova T， Chaudhary D， Borde M， Chernova I， Iwai Y， Long AJ，Brown JA， Nunes R et al. 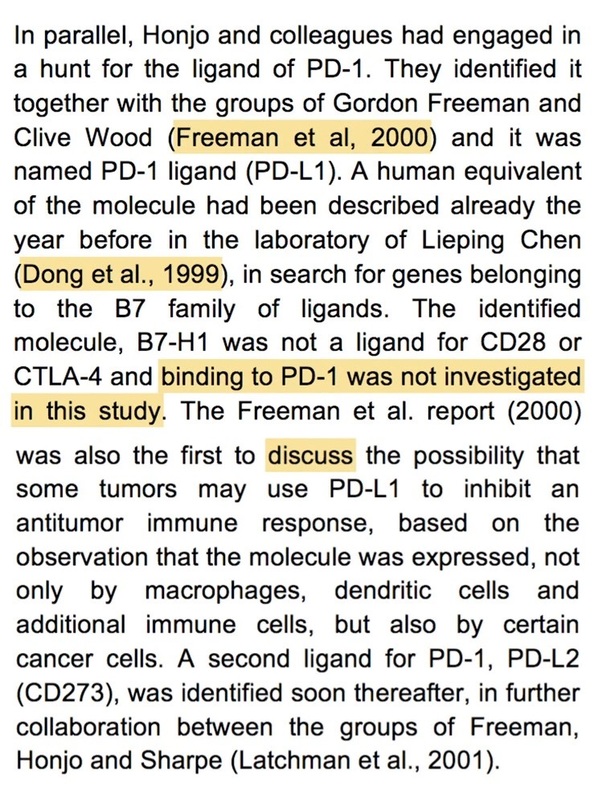 PD-L2 is a second ligand for PD-1 and inhibits T cell activation. Nat Immunol. 2001，2（3）：261-8. 13. Tivol EA， Borriello F， Schweitzer AN， Lynch WP， Bluestone JA， Sharpe AH. Loss of CTLA-4 leads to massive lymphoproliferation and fatal multiorgan tissue destruction， revealing a critical negative regulatory role of CTLA-4. 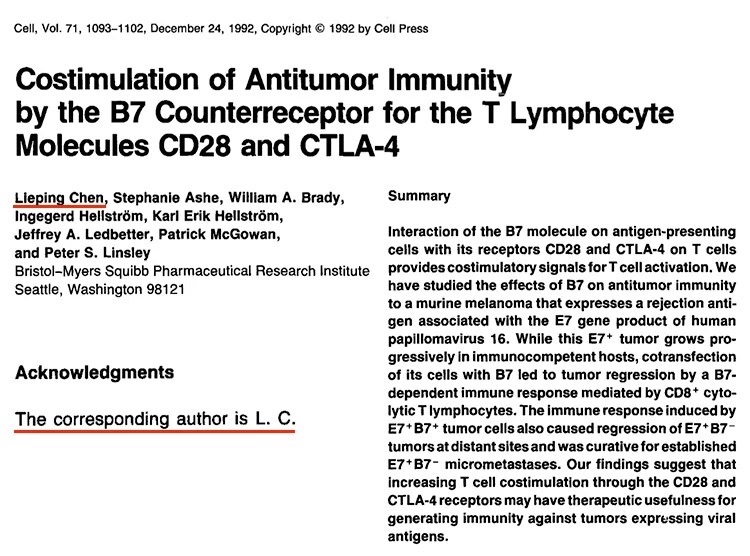 Immunity.1995， 3（5）：541-7. 14. Waterhouse P， Penninger JM， Timms E， Wakeham A， Shahinian A， Lee KP， Thompson CB， Griesser H， Mak TW. 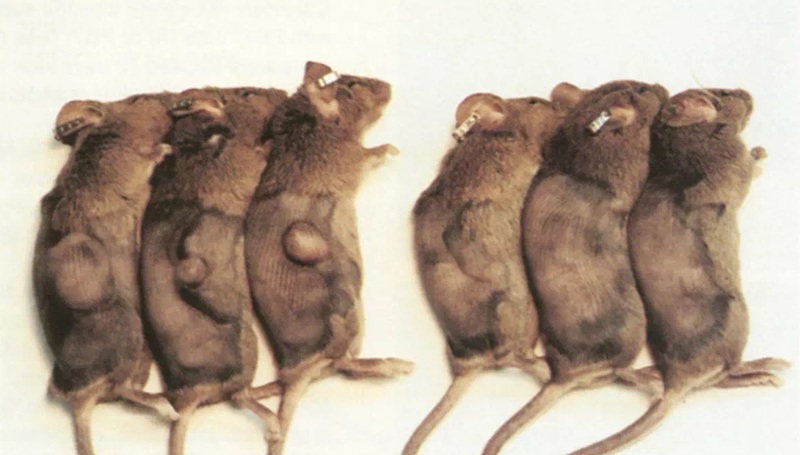 Lymphoproliferative disorders with early lethality in mice deficient in Ctla-4. Science. 1995， 270（5238）：985-8. 15. Walunas TL， Lenschow DJ， Bakker CY， Linsley PS， Freeman GJ， Green JM， Thompson CB， Bluestone JA. CTLA-4 can function as a negative regulator of T cell activation. Immunity. 1994， 1（5）：405-13. 16. 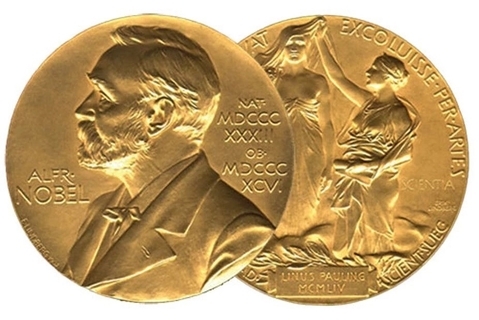 Nobel committees must do more to achieve equality. Nature. 2018.